Three Bad Omens - What's Your Halloween Tradition? Three Bad Omens – What’s Your Halloween Tradition? This is it. Only 3 days left until Halloween! We’ve prepared for the ultimate Halloween party with some wicked party hacks, and of course our Halloween costumes are ready to win all the costume contests! What’s left to prepare? Everyone has their own Halloween tradition of what (or what not) to do. Don’t walk under a ladder. Don’t spill the salt. Don’t scare the neighbour’s cat. What do we do on Halloween? We mess it all up, and do it anyways. Beetlejuice, Beetlejuice, Beetlejuice! Summon ghosts, break mirrors, it’s time to get a little crazy for Halloween! Here are our top 3 bad omens that you can choose whether or not to follow or break during Halloween! Bad things happen to those who cross a black cat in their path. Why are they in your way? Why do they cut your path? We don’t know why the cat crossed the road, but we do know that you want to avoid crossing one in fear of bad luck. Are you the type to cross a black cat in your path anyways? You’re a brave one. We like you. Whelp! Let’s break one. What could possibly go wrong? Do you believe in ghosts? Apparently, opening an umbrella indoors will invite unwanted ghosts from the outside, who hide within your umbrella. Who knew that umbrellas made such a cozy home for spooky spectres! Are you brave enough to openly invite yourself to be haunted by spirits? What are some superstitious omens that you believe in? Do you try to avoid them, or is it your tradition to break them one day every year? 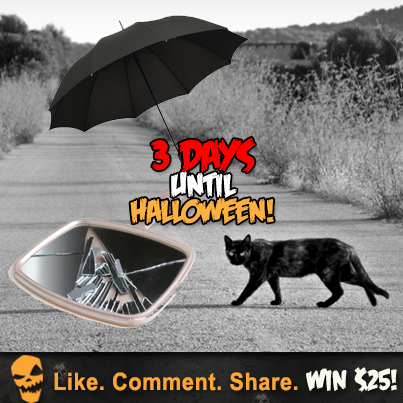 Let us know what your Halloween tradition is, and earn a chance to win $25 in gift credit just by commenting on Facebook! Plan the Ultimate Halloween Party! Perfect Your Comic Girl Halloween Costume!